We’d love your help. Let us know what’s wrong with this preview of A Penny For Your Thoughts by Robert Ford. Fresh from a stretch in prison, Joe Openshaw is living at home with his father and trying to get his life together again. He has let go of old habits, especially the ones that turned him into an addict and helped land him in prison. On a hike along the Lowback Trail, Joe stumbles on one of the town's oldest secrets--buried long ago, if not forgotten. It's an unusual but safe Fresh from a stretch in prison, Joe Openshaw is living at home with his father and trying to get his life together again. He has let go of old habits, especially the ones that turned him into an addict and helped land him in prison. It's an unusual but safe enough treasure--a jar of old pennies. What interests Joe isn't the pennies themselves, but the pieces of paper taped to every coin--a child's handwritten wish on each one. When the first few wishes come true, they are simple things. Fun. Harmless. Except as time goes on, Joe realizes they aren't really wishes at all...they're exchanges, and the bill was racking up. To ask other readers questions about A Penny For Your Thoughts, please sign up. I recently started reading Matt Hayward's work with his most recent book, The Faithful, of which I said, "If you're a fan of Lovecraftian horror, you don't want to miss this one. Certainly recommended." I've long been a fan of Bob Ford. Read anything by Bob and I can promise you won't be disappointed. One of the cool backstories to A Penny For Your Thoughts is that Matt lives in Ireland and Bob in Central Pennsylvania, a distance of about 3,300 miles, not to mention an entire ocean. Thank God for the internet, without which this book would be nigh on impossible. And that would be a shame because this book is so damn good. "Whenever I take the Lowback Trail, I always find something new: unknown names carved into tree trunks, discarded briefs by overeager dippers, a smoldering pit left from weekend hikers…but today? Today I found a penny jar." Yep. It all started with that damn jar of pennies. Wheat pennies, to be exact. Pennies with wishes taped to them. Wishes which when read, came true. Just ask Kenny who read the one about wanting big boobies. It seems the pennies were also reusable for new wishes. It also seems each wish came with a price. What could possibly go wrong? "Rumor had it those waters were home to a school of catfish so big they'd eat a gaggle of kids and ask for seconds." "Place was quiet as a mouse fart." "Sometimes you can't let a fart without a neighbor three doors down knowing what you had for dinner,"
Overall, A Penny For You Thoughts gave me that Twilight Zone vibe. I love that feeling the reader gets when the writers are just "in the zone". This is a story which is humorous, dark, bittersweet, and despite its outlandish plot, it somehow manages to be completely believable. 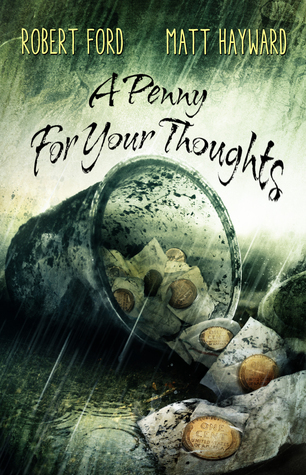 Published by Poltergeist Press, A Penny For Your Thoughts is available for pre-order. Scheduled for release on June 1, 2019, the book will be available in hardcover, paperback, and e-book formats. Robert Ford has published the novels, The Compound, and No Lipstick in Avalon, the novellas, Ring of Fire, The Last Firefly of Summer, Samson and Denial, Bordertown and the short story collection The God Beneath my Garden. In addition, he has several screenplays floating around in the ether of Hollywood. He can confirm the grass actually is greener on the other side, but it’s only because of the bodies buried there. Matt Hayward is a Bram Stoker Award-nominated author and musician from Wicklow, Ireland. His books include Brain Dead Blues, What Do Monsters Fear?, Practitioners (with Patrick Lacey), and The Faithful. He compiled the award-winning anthology Welcome To The Show, and is currently writing a novel with Bryan Smith. Matt wrote the comic book This Is How It Ends (now a music video) for the band Walking Papers, and received a nomination for Irish Short Story of the Year from Penguin Books in 2017. This book rocks. End of review. I kid, of course, but as with any book that I truly enjoy, it’s hard to write a review that doesn’t fangirl all over the place or give away entirely too much of the novel. Have no fear of spoilers, but I cannot guarantee there won’t be some moments of cheerleading. As mentioned in the synopsis above, this novel mainly focuses on Joe Openshaw and his slow reintroduction into society after a stint in prison, thanks largely to a wicked heroin addiction. He is flawed, resilient, and engaging. His relationship with his father is touching and REAL. There are problems, devastation, and a true sense of a father/son relationship. This is the part that dug its claws into my heart, and probably one of the reasons I’m still thinking about this book a week after reading it. The remaining cast of characters aren’t just props, however. They are fully realized and we learn more about them organically as the story naturally progresses. There are no tedious info dumps or poorly done flashbacks. Even the characters with the smallest part to play add a richness to the novel. As with some of my favorite novels, horror or not, this story provides a deeper meaning to it all. How far is too far to get what you want? Where is the line between right and wrong/love and hate? I liked the integration of this – it’s not gimmicky or “over done”; it just is. As a collaboration, this factor alone shows the writing chops of both Ford and Hayward. BUT WAIT! This isn’t all gloom and doom and deep, emotional thoughts. There are parts of this book that made me CRY WITH LAUGHTER. I had to put the book down and wipe my face. So much so that I had to take a moment to message Matt and Bob and share my joy. I DO NOT normally do this – but who could I tell??? I knew I was one of the first to read it and there was no way I’d risk spoiling something this hilarious for anyone else. They were, thankfully, gracious about my message – I enjoyed sharing it with them. I cannot wait for all of my bookish friends to read this and hear their reactions. Incredible story. Well-written, great plot twists, and characters that make you want to dive into the pages to help them. Put this on top of your must-read list for 2019. It's THAT good. A PENNY FOR YOUR THOUGHTS by Bob Ford and Matt Hayward is exactly what I want in a book. Not just a well planned and well written book, but well edited as well. A collaboration is not easy to pull off, usually the authors simply round robin the chapters or the characters. It can be easy to tell who wrote what. But this story flowed very well. It's clear a lot of thought went into the preparation of this before putting it out for review. The characters are people. Just people. People with problems. People that make wishes. People that don't make the best choices. But sometimes wishes come true, right? Sometimes you see magic happen right in front of you. And then you need to make a choice. Joe was recently released from prison for a robbery conviction. He’s doing his best to keep his parole officer and his dear dad convinced he’s staying away from drugs and a life of crime. Unfortunately, bad influences like his friend Kenny, his former drug dealers, and his girlfriend Angie abound. As much as he wants to go straight, he misses the oblivion of the drugs, and he can’t imagine doing the day-in-day-out grind of his Dad’s mill job. Guys like Joe wish for a better life, yet the only kind of luck they draw happens to be of the bad variety. After an unexpected find in the woods, he discovers that magical pennies may make wishes come true, but the costs go way beyond a single cent. A PENNY FOR YOUR THOUGHTS is a well-crafted tale. Every single story promise is paid off in spades. Every character shines. Every page pulls the reader deeper into Joe’s personal noir nightmare. The story contains hits of humor, which somehow make the emotional cuts even deeper. This new spin on the old adage “be careful what you wish for” is a wild and scary thrill ride. Thanks to the authors and Poltergeist Press for the opportunity to experience this novel in advance of its release. First off I was graciously provided this ARC by the author pre-release and my review is my own. Joe is a post addict released from prison with demons already at his heels. Growing up in a blue collar forgettable neighborhood with a Dad who loves his son more than anything. Joe finds a jar of wheat penny wishes that seems amusing at first, until they become to come true. Kenny, his best not best friend and Eva? She’s an amazing character rounds out a supporting cast of who are on an adventure to First off I was graciously provided this ARC by the author pre-release and my review is my own. An amazing read!! I couldn't tell which author wrote which section. Matt Hayward and Robert Ford blend together so beautifully, you'd think they'd been collaborating for years... and hope they do it again. No favoritism, no nepotism, this is truly a great story and must-read from both of them.